Ban signs documents to process Abbas's requests, 'State of Palestine' to join conventions May 2. Other countries to follow suit and approve. 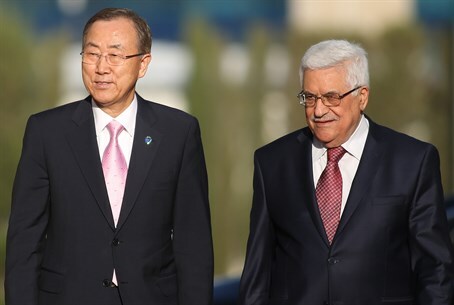 United Nations (UN) Secretary General Ban Ki-Moon on Wednesday signed official documents, confirming reception of and starting processing for Palestinian Authority (PA) Chairman Mahmoud Abbas's requests to join international conventions that are also signed by the UN. Ten of the 15 conventions the PA wishes to join are co-signed by the UN. Abbas's requests, submitted last Tuesday, are in breach of the conditions for peace talks between Israel and the PA. The requests have effectively brought the talks to a dead end, even more so than his adamant refusal to recognize Israel as the Jewish state. Ban wrote in the official documents that the "State of Palestine" would added to the international conventions on May 2, marking 30 days from Abbas's request, reports Channel 10. "The secretary general has ascertained that the instruments received were in due and proper form before accepting them for deposit," UN spokesman Stephane Dujarric said, adding that all member states of the conventions had been informed. "It is important to emphasize that it is for states to make their own determination with respect to any legal issues raised by instruments circulated by the secretary general," Dujarric remarked. The applications include requests to join the Vienna Convention on diplomatic relations, the convention on the rights of the child, the convention against torture, and the convention against corruption. It is worth noting a January report by the Palestinian Independent Commission for Human Rights (ICHR) revealed rampant PA human rights abuses. Aside from the ten conventions Ban has signed off on, the PA requested to join Switzerland's Fourth Geneva Convention from August 1949 and the first additional protocol. It has also asked the Netherlands to join the Hague Convention of 1907 on laws and customs governing war. Officials report that the two countries will accept the requests in the near future, following suit after Ban. The PA was granted observer state status by the UN in November, 2012. In response to the PA's blatant breach of the peace talk conditions, Israel has leveled sanctions and punitive measures against the entity, with Prime Minister Binyamin Netanyahu on Wednesday ordering the cessation of all governmental ties with PA officials, aside from ties concerning the Defense Department and peace talks. Following the sanctions, a senior member of Abbas's Fatah movement warned on Wednesday that the sanctions would lead to the dismantling of the PA.